The first film in Amber’s coalfield trilogy, exploring women’s lives in the aftermath of the last colliery closures in East Durham. 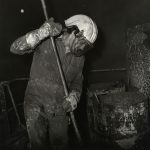 Rooted in the relationships Amber made in the coalfield in the early 80s, the film drew on the participation of a number of the women involved in the Support Groups during the Miners’ Strike. Like many of these, May Murton (Charlie Hardwick) feels like she has been left to clean up the mess: the failure of a marriage , community disintegration and teenage children (Darren Bell and Katja Roberts) increasingly out of control. Her estranged husband (Brian Hogg) has taken up residence in the allotments. The manager of an open cast coal mine (Bill Speed) meets her at a dance, the night before the Miners’ Gala… Like Father (2001), the second film in the trilogy explores male experience. Shooting Magpies (2005), the third, looks at the post-industrial generation and the impacts of heroin in the colliery villages of East Durham.